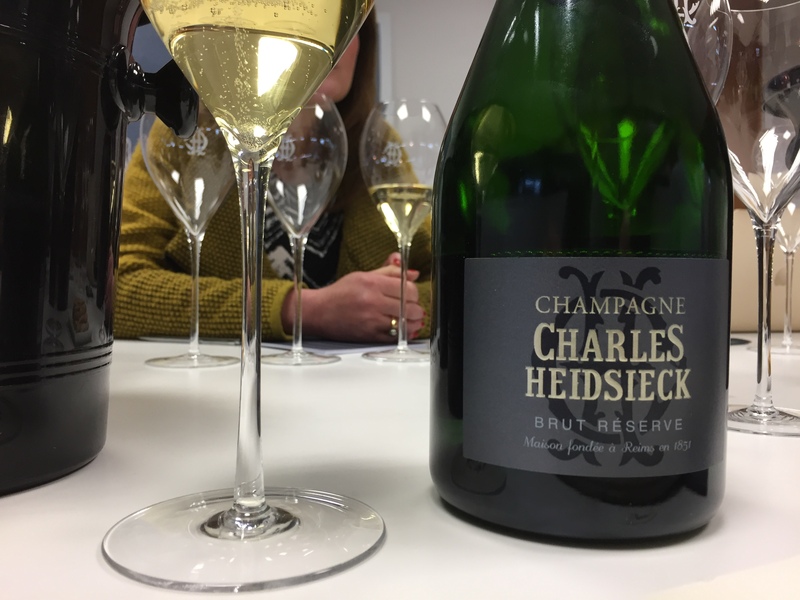 Heidsieck was a popular surname in 19th century France, but there’s no competition between Piper and Charles. Owned and managed by the same luxury firm, like all good siblings they also share a room, both situated within the same grounds in Reims. Standing within the grand reception room of the elaborate golden Piper-Heidsieck HQ building, we were greeted by Dominique, International Brand Ambassador for both Piper and Charles. From here our experience began, as Dominique led us over to the Charles Heidsieck winery towards the rear of the complex, where our tasting of the Vins Clairs was to take place. And what a complex it is – vast grounds house multiple modern, yet nondescript buildings that leave one equally impressed and intrigued. We visited on Friday morning with Essi Avellan MW and were surprised by how deserted the place appeared to be. “Not many employees work on Friday in Champagne,” explained Dominique. 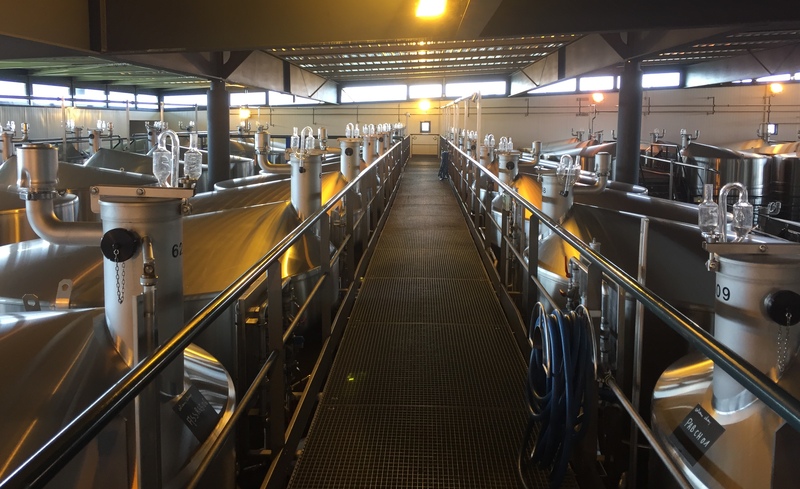 “They prefer to start earlier on the weekdays instead.” We couldn’t help but wonder if we were perhaps in the wrong section of the industry…. 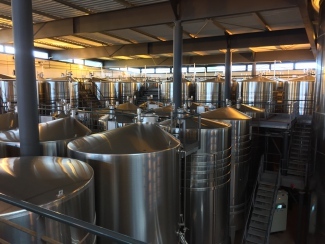 After a brief introduction of the factories where disgorgement, dosage and labelling take place, Dominique opened the doors to the winery itself. 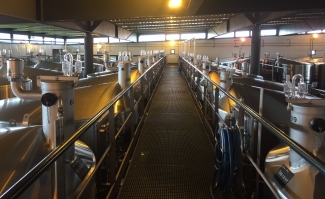 An imposing building containing close to 100 stainless-steel tanks varying in size, all connected and accessible by a clever labyrinth of suspended walkways, the scale of operation here is quite grand. 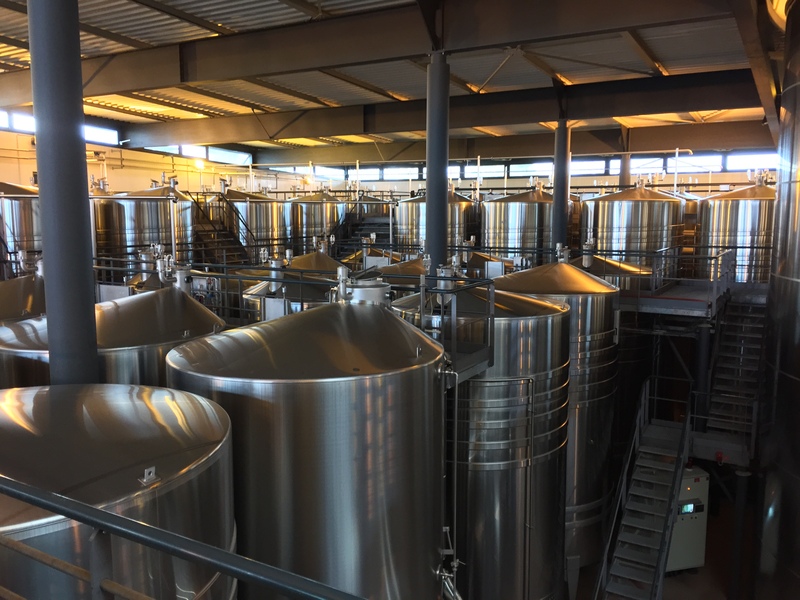 Laboratory-clean, each tank glistened with pride, and we were told the centre-piece – two huge stainless-steel blending tanks – hold enough wine to fill half a million bottles of Champagne each. 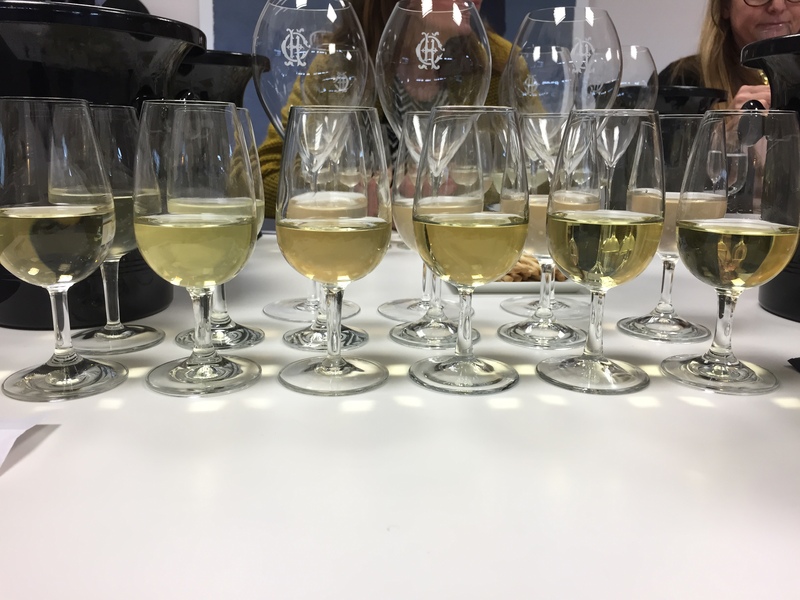 Having sufficiently whet our appetites, Dominique led us to the tasting room where we were to sample the 2016 base wines. Chef de Cave Cyril Brun was unfortunately away in Japan, but we were left in the capable hands of his number 2, assistant winemaker Stéphane Lipreau. Stéphane began with the customary overview of the 2016 season. Highlighting the difficulties in the summer, he commented: “July was scary… lots of downy mildew. 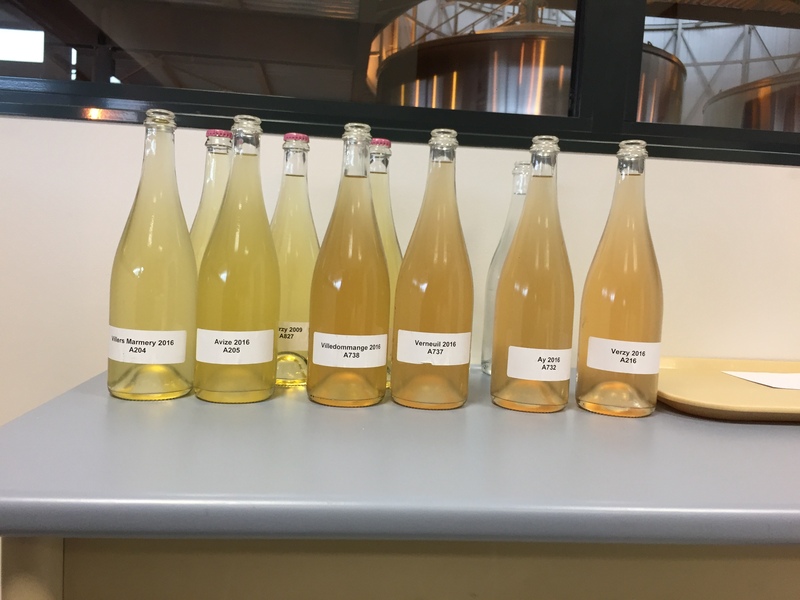 But we couldn’t believe our luck when the weather dried up for September.” Describing the harvest as “perfect”, Stéphane reflected what we’d been hearing all week – ideal weather in September was a huge relief for winemakers all over the region. 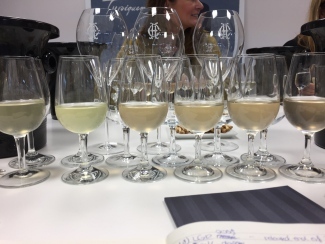 For our 2016 base wine tasting, Stéphane presented two Chardonnay’s, two Pinot Meunier’s and two Pinot Noir’s from a range of villages across Champagne. Unusual vineyard as Chardonnay is not normally grown in the north of Montagne de Reims. This has great fresh apple notes and hints of peach. Good structure with a hint of bitter and a tangerine edge. Fruit intensity gives impression the acidity is lower than it probably is! Wonderful ripeness suggested by the nose and a hint smoky. Lots of ripe red apple flavours, with tropical hints coming through with apricots, hint of pineapple and some spiciness; great length. Meaty edge and hints of black fruit on the nose. More subtle strawberries and blackcurrant on the palate. Great acidity and very fruity. Moderate length. Lots of delicate fruits – packed with strawberry and blackberry flavours. Hints of peachiness, apricots and a hint of tangerine. Has a real fleshiness of fruit. Very expressive! Some tropical notes. Lovely structure, balance and richness. Loads of apricots and tangerine and seems to go on forever. Good acidity and some meatiness on the finish. Very good! PN from Ay is looking great this year. Much more red fruits, strawberries etc. Nice soft texture, expressive redcurrants on the palate. Good energy and vivacity. Could drink now. After we had tasted the 2016 Vins Clairs, Stéphane informed us of our next experience – we were to sample Charles Heidsieck reserve wines from the same village across a variety of vintages. 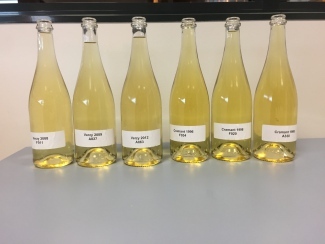 He had prepared Chardonnay reserve wine from three vintages of the northern Montage de Reims village, Verzy and Pinot Noir reserve wines from three vintages of the southern Côte des Blancs village, Cramant. 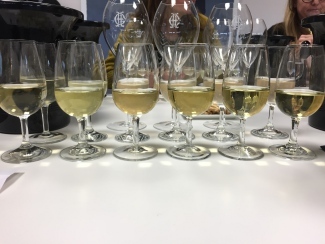 This included Cramant from the exquisite 1996 vintage, the oldest reserve wine Charles Heidsieck currently stock and the oldest we tasted on our Vins Clairs 2016 trip. Slightly tighter than others. Lots of apricots and good acidity. Quite delicate but drinkable. Less expressive and tighter than the 2008. Good mouth-feel, less acidity but more tangerine and lychee flavour. Very aromatic. Big expressive nose! Real tastiness and bright acidity. Concentrated lemon flavour on the palate. This has great length – flavours keep coming out more as you leave it. Hint bitter finish, but very nice! Very perfumed with lychee and apricot aromas. Peaches and cream flavour shows through on the palate. Warmth, tastiness and loads of roasted cashew notes. Again, lots of lychee here with peaches and cream hints. Very rich and complete. Slightly softer acidity and great complexity! Loads of flavour here, this is still a powerhouse! The acidity is holding up beautifully, this is just delicious. Could drink and drink. After tasting both the 2016 base wines and reserve wines from six different vintages, Essi was again inspired into assemblage! For their annual Brut Réserve NV, Charles Heidsieck use 60% current vintage wines and 40% reserve wines (the maximum allowable amount). In a light-hearted challenge to good friend and cellar master Cyril Brun, Essi was professionally precise and gathered the appropriate measuring instruments to set about creating a 200ml blend – using 120ml (60%) of the available 2016 wines and 80ml (40%) of the available reserve wines. 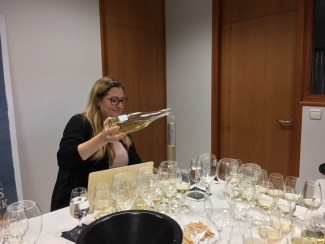 Essi Avellan MW practising being Chef de Cave – watch out Cyril Brun! 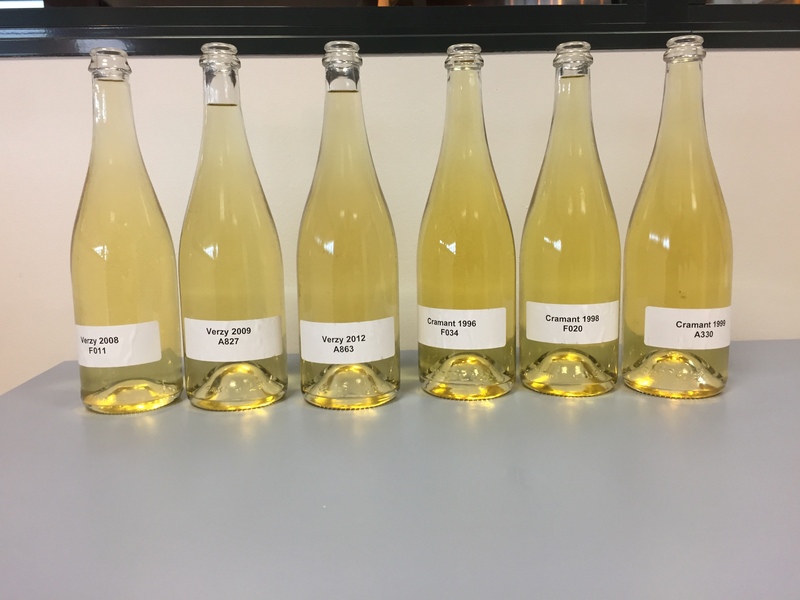 The final blend: Essi Avellan Brut Réserve NV! 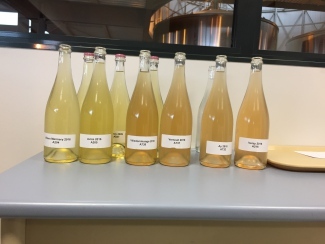 The final blend was an expertly balanced 40% Pinot Noir, 40% Chardonnay and 20% Pinot Meunier grape variety mixture. 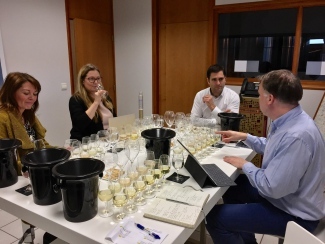 Stéphane then guided us through a tasting of the current Charles Heidsieck Champagne range. Starting with Charles Heidsieck Brut Réserve NV (with 2008 as a base vintage) – a champagne we are very familiar with but never tire of tasting – it seems the 2008 vintage can do wrong: this was simply stunning! 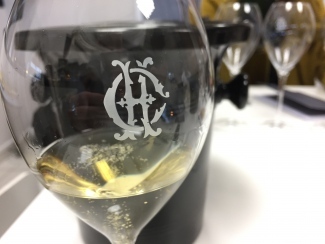 Containing wine from over 60 crus, a huge percentage of Charles Heidsieck sales come from this Champagne. A big nose of toasty aromas and great roundness on the palate – much power is contributed by the high percentage of reserve wines. 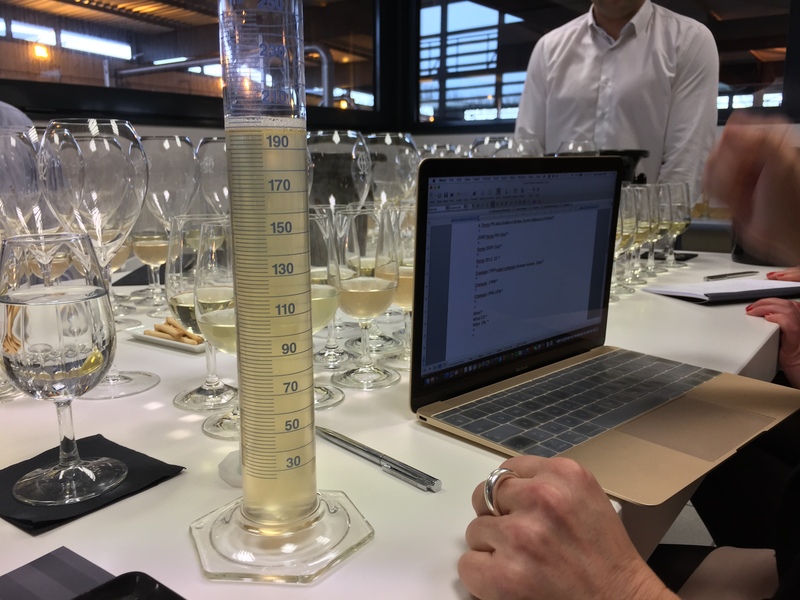 After tasting the Cramant reserve wines, it’s much easier to add content to the blend – we started to see real evidence of the reserve wines at work. 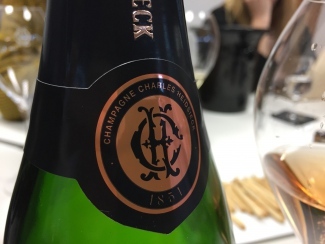 Next up was a Champagne we have a great relationship with: Charles Heidsieck Rosé Millésimé 2006. This placed second in our blind tasting of fourteen prestige Rosé Champagnes (read here); a considerable achievement amongst some formidable competition. Giving us some background on the 2006 vintage, Stéphane commented that it was a great year for Pinot Noir, which experienced unusually early ripeness. With just 8% red wines (from Hautvillers and Verzenay) added, the impressive red berry flavours are a delightful surprise. Given time to develop, delicious spiciness and ginger notes start to shine through. 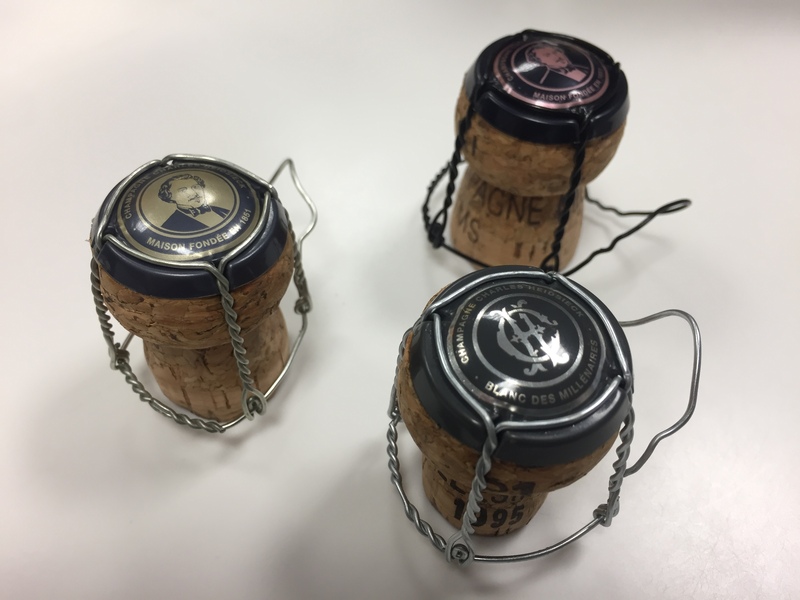 This was as expressive as we’ve come to expect as standard – one of our favourite Rosé Champagnes for a reason. 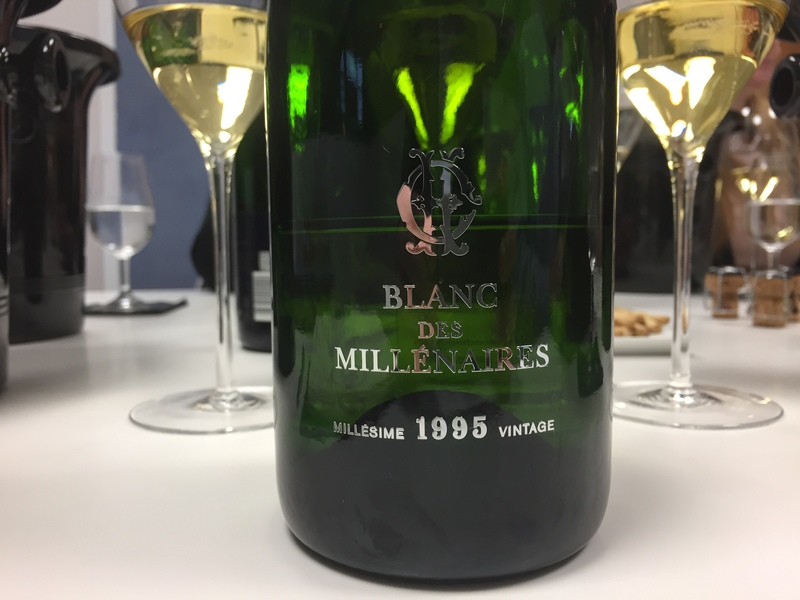 The last Champagne we tasted was Charles Heidsieck Blanc des Millénaires 1995. Now over 22 years old, this is still the current vintage of the Blanc des Millénaires cuvée. Pure Chardonnay, this contains wine from just 5 Grand Cru vineyards in the Côte des Blancs, including: Avize, Cramant, Oger and Vertus. This had all the characteristic creaminess and power of the 1995 vintage – loads of lemon and lime flavours burst out on the palate. Incredible length and that wonderful acidity is still present. Stéphane also shared his preferred accompaniment – barbecued sea bass… life in Reims is clearly not all hard work! What a trio from ‘Champagne Charlie’! Exiting along the grand suspended walkway, it was difficult to convince ourselves to keep walking. Sharing with us Charles’ development plans for the future, Dominique explained how the House will be growing vines on the lawn outside the winery to help tell the growth and development story of Chardonnay, Pinot Noir and Pinot Meunier grapes. Innovation like this coupled with Cyril Brun’s experience at the helm, Charles Heidsieck are heading in an exciting direction. ‘Till next time!